ON DECK at Waterline Boats! When construction of the Markos Cutter and the Grand Banks Classic listings are complete they will appear on our Waterline Boats Inventory page with a photo and link to their complete specifications, up to 80 large format photos and video tour! Beat the rush! Call 206-282-0110 before these listings go live to learn more or to make an appointment for your personal preview. Then speak to one of our specialist brokers about what Waterline Boats / Boatshed can do for you! We will view your boat, take up to 80 interior and exterior photos. Plus build an inventory and list the boat’s full specifications in detail. It will then go live on boatshedseattle.com and across all Boatshed offices world wide. With offices from Seattle to Athens to Phuket. We also advertise on Yachtworld.com, Boattrader.com, and many other boat-specific websites as well as print media. We handle the whole sale including viewings, negotiations, contracts and post sale services. Our crew strives to make the process enjoyable and easy for buyers and sellers. The 10th edition of the Clipper Round the World Race, with twelve 70’ one-design monohull sailboats competing, is departing for leg 7 from Seattle to New York on Thursday 28 April. Waterline Boats encourages all Seattle-area boaters to be afloat to cheer the fleet on Elliott Bay during the Parade of Sail from 1500 to 1700. The boats called on Seattle for about a week after a non-stop Pacific crossing from Qingdao, China. The winning boat completed the crossing in 25 days. The next leg, to New York City via the Panama Canal will have the crews at sea for over 50 days. Scott Helker of Waterline Boats / Boatshed Seattle enjoyed a visit and a brief sail aboard the boat PSP LOGISTICS and came away thoroughly impressed by the determination, sense of adventure and hardiness of the crew. This race is truly a skills and endurance test and is everything but a yachty round-the-world cruise. Accommodations are spartan, the work is hard, and the conditions can be exceptionally challenging. Skipper Max Stunell leads a cheerful and dedicated team who are to be thanked — their kindness and patience in hosting Scott and many other Seattle gawkers and dreamers after barely a moment’s rest following a difficult crossing of the Pacific was greatly appreciated. Crew members join the race for single or for multiple legs as their time and money allow, and undergo intensive training prior to boarding their boats. Featured in these photos is Sue Ball, from the UK, crewing aboard PSP LOGISTICS for the entire circumnavigation. GOOD LUCK and SAFE VOYAGE to the boats and their crews as they continue racing toward completion of their circumnavigation with a return to London in July. 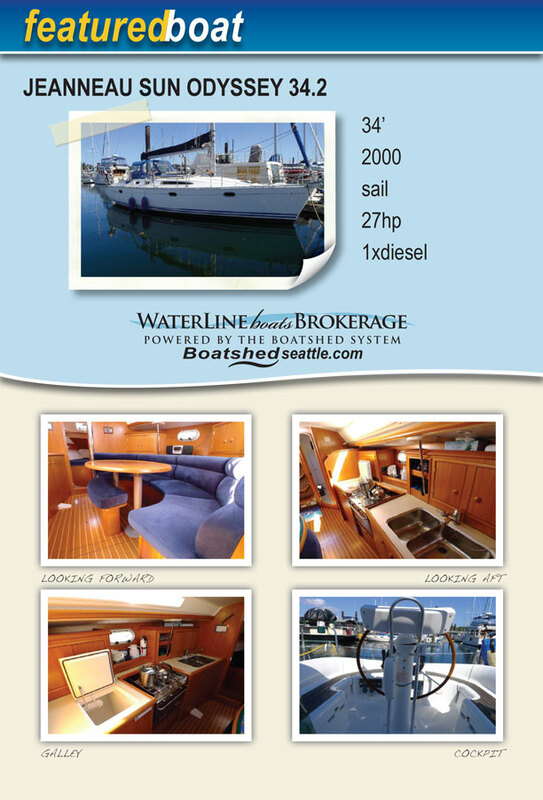 Waterline Boats/Boatshed Seattle is pleased to welcome the newest member of our crew, Amber Candelaria. Amber has more than a decade of customer service under her belt. She’s handled the marketing and management of a couple of businesses here in Seattle and looks forward to putting her experience and her degree in Mass Communications to work here at Waterline Boats / Boatshed. A true Jill-of-all-trades, Amber is doing a little bit of everything and anything for us here in the office. She’ll be marketing our Brokerage services to boat owners, helping sellers through our listing process and helping potential customers find their “Dream Boat”. Stop by or call and she’ll be the first friendly face and voice you see and hear. It’s 34.2! The design of the 2000 Jeanneau Sun Odyssey 34.2 makes it function and feel larger than a 34 foot vessel. Stepping below you are greeted with a saloon abundant in warm teak and designed with chic European styling. The dinette is a clever semi-circle lounge seat with an elliptical table and sliding bench seat on the opposing side. The galley has ample pantry and counter space, a two-burner gimballed stove/oven and double stainless steel sinks that make for easy cooking and entertaining. The forepeak cabin and aft double cabin are each worthy of the “master stateroom” title. The starboard and aft heads are also impressive in their size and appointments. A user-friendly boarding platform and walk-through transom lead you to a teak-lined sizable cockpit that is able to seat six adults comfortably. A masthead rig with full battened main and furling jib make this Jeanneau fun and easy to sail.